Cultural neuroscience is a new interdisciplinary field that studies how cultural values such as practices and beliefs shape and are shaped by the mind, brain and genes across multiple timescales. The two main questions in cultural neuroscience is how does culture shape behavior and neurobiology and how does neurobiology reflect culture. The study of cultural neuroscience bridges theory and methods from anthropology, psychology, neuroscience and genetics. Cultural neuroscientists study cultural variation in mental, neural and genomic processes as a means of articulating the bidirectional relationship of these processes and their emergent properties using a variety of methods. Researchers in cultural neuroscience  are motivated by two fundamentally intriguing, yet still unanswered, questions on the origins of human nature and human diversity: how do cultural traits (e.g., values, beliefs, practices) shape neurobiology (e.g., genetic and neural processes) and behavior and how do neurobiological mechanisms (e.g., genetic and neural processes) facilitate the emergence and transmission of cultural traits? The idea that complex behavior results from the dynamic interaction of genes and cultural environment is not new; however, cultural neuroscience  represents a novel empirical approach to demonstrating bidirectional interactions between culture and biology by integrating theory and methods from cultural psychology, neuroscience and neurogenetics. Cultural neuroscience is unique in that it primarily adopts the experimental methods of cultural psychology and models of dual inheritance theory as the means to uncovering how mental, neural and genetic events vary as a function of specific culture traits (e.g., values, practices and beliefs) in some meaningful way. Research in cultural neuroscience has practical relevance to transcultural psychiatry, business  and technology as well as broader implications for global public policy issues such as population health disparities, bioethics, globalization, immigration, interethnic ideology and international relations. Cultural differences exist in the ventral visual cortex and many studies have shown this. In a study conducted in 2005 they found that East Asians were more likely to keep their eyes focused on background scenes than westerners who would instead focus more on the central object such as a giraffe in a savanna. In a similar 2006 study it showed that in congruence to the difference in society structure westerners showed more activation in object processing regions, including the bilateral middle temporal gyrus, left superior parietal gyrus, and right superior temporal gyrus, although no activation differences were observed in context-processing regions such as the hippocampus. However, there has been some research contradicting cultural bias in the oculomotor control such as one conducted in 2007 by Rayner, Li, Williams, Cave, and well who failed to find evidence that East Asians focus more on context although they did find evidence that they are more likely to focus less on central objects. In a different study they focused more on difference in attention towards faces. They proved that Americans focus more broadly on the entire face such as both the eyes and mouth while Asians focus more on a single part, such as the mouth. The authors point out that this happens due to gaze avoidance in east Asian culture as a way of politeness. In 2008, another study focusing on context showed that East Asians were more likely to include greater details and background when taking photographs of a model when they were free to set the zoom function of the camera as they saw fit. In 2003, a group of researchers used the Frame-Line Test and asked the participants to draw a line of either the exact same length as the one showed or one that was proportional in size. Americans were more accurate in the absolute task, suggesting better memory for the exact or absolute size of the focal object, but East Asians were more accurate in the relative (proportional) task, suggesting better memory for contextual relationships. In a later study conducted by the same group they found a pattern within the cultures when processing emotions. East Asians were less likely to know the difference between fear and disgust than Americans when sampling faces. Many studies conducted proves that constant repetition in a certain skill has an effect on brain activity. For example, in a 2000 study they showed that taxi drivers in London showed larger gray matter in the posterior hippocampi than the average civilian. A different study in 2004 showed that those who know how to juggle have an increase in volume of the cortical tissue in the bilateral midtemporal area and left posterior intraparietal sulcus. ↑ Ames, D. L.; Fiske, S. T. (2010). "Cultural neuroscience". Asian Journal of Social Psychology. 13 (2): 72–82. doi:10.1111/j.1467-839X.2010.01301.x. ↑ Han, S.; Northoff, G. (2008). "Culture-sensitive neural substrates of human cognition: A transcultural neuroimaging approach". Nature Review Neuroscience. 9: 646–654. doi:10.1038/nrn2456. ↑ Caspi, A.; Moffitt, T. E. (2006). "Gene–environment interactions in psychiatry: joining forces with neuroscience". Nature Reviews Neuroscience. 7 (7): 583–590. doi:10.1038/nrn1925. ↑ Cacioppo, J. T.; Berntson, G. G. (1992). "Social psychological contributions to the decade of the brain: Doctrine of multilevel analysis.". American Psychologist. 47 (8): 1019–1028. doi:10.1037/0003-066X.47.8.1019. PMID 1510329. ↑ Domínguez D, JF; Turner, R; Lewis, ED; Egan, GF (2010). 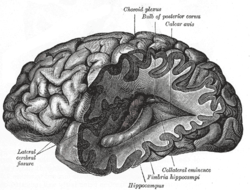 "Neuroanthropology: A Humanistic Science for the Study of the Culture–Brain Nexus". Social Cognitive and Affective Neuroscience. 5: 138–47. doi:10.1093/scan/nsp024. ↑ Rilling, J. K. (2008). "Neuroscientific approaches and applications within anthropology". American Journal of Physical Anthropology. 137 (47): 2–32. doi:10.1002/ajpa.20947. ↑ Rilling, J. K.; Barks, S. K.; Parr, L. A.; Preuss, T. M.; Faber, T. L.; Pagnoni, G.; Bremner, J. D.; Votaw, J. R. (2007). "A comparison of resting-state brain activity in humans and chimpanzees". Proceedings of the National Academy of Sciences. 104 (43): 17146–17151. doi:10.1073/pnas.0705132104. PMID 17940032. ↑ Smedley, BD (2008). "Moving beyond access: Achieving equity in state health care reform.". Health Affairs. 27: 447–455. doi:10.1377/hlthaff.27.2.447. ↑ Park, Denise C.; Huang, Chih-Mao (2010-07-01). "Culture Wires the Brain: A Cognitive Neuroscience Perspective". Perspectives on psychological science : a journal of the Association for Psychological Science. 5 (4): 391–400. doi:10.1177/1745691610374591. ISSN 1745-6916. PMC 3409833 . PMID 22866061. ↑ Driemeyer, Joenna; Boyke, Janina; Gaser, Christian; Büchel, Christian; May, Arne (2008-07-23). "Changes in Gray Matter Induced by Learning—Revisited". PLoS ONE. 3 (7). doi:10.1371/journal.pone.0002669. ISSN 1932-6203. PMC 2447176 . PMID 18648501. Chiao, J. Y.; Blizinsky, K. D. (2009). "Culture-gene coevolution of individualism-collectivism and the serotonin transporter gene". Proceedings of the Royal Society B. 277: 529–37. doi:10.1098/rspb.2009.1650. PMC 2842692 . PMID 19864286. Kim, H. S.; Sherman, D. K.; Taylor, S. E.; Sasaki, J. Y.; Chu, T. Q.; Ryu, C.; Suh, E. M.; Xu, J. (2010). "Culture, serotonin receptor polymorphism and locus of attention". Social Cognitive and Affective Neuroscience. 5 (2-3): 212–218. doi:10.1093/scan/nsp040. PMID 19736291. Seligman, R.; Kirmayer, L. J. (2008). "Dissociative experience and cultural neuroscience: narrative, metaphor and mechanism". Cultural Medicine & Psychiatry. 32: 31–64. doi:10.1007/s11013-007-9077-8.